Sleep better with the assurance that you will know your baby’s every move. That’s the beauty of the Infant Optics DXR-5 Baby Monitor. What’s more, this useful, user-friendly baby monitor isn’t going to cost you an arm and a leg. Forget paying more for gimmicks and added features the competition tries to convince you that you can’t live without. Odds are you are never going to use those “added value” gizmos! The Infant Optics DXR-5 is simplicity personified. It is so easy to set up and operate that anyone can do it—no engineering degree required! Moreover, this monitor is affordable. Save the money you’d pay for other security devices and spend it on baby toys instead. 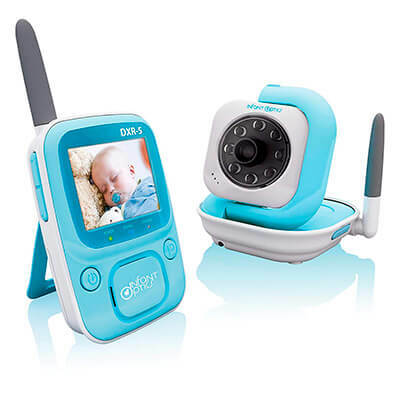 The original Infant Optics DXR-5 2.4 GHz Digital Video Baby Monitor is a compact, highly portable, efficient warning device. With this monitor parents, the nanny, sitters, and other caregivers get peace of mind with this easy-to-read monitor of their charge’s every movement and sound. This monitor’s audio system is so sensitive that you can hear and see what baby is doing from any room in your house. This slim, lightweight device is equipped with a 2.4GHz digital wireless FHSS communication link. The night vision baby monitor is completely secure. It provides superior sound and video clarity. The 2.4” super bright TFT screen is powered by a rechargeable lithium-ion battery. You’re good for hours and hours of portable use. In addition to the 2.4″ TFT screen, this monitoring device has a sensitive built-in microphone. Night vision baby monitor uses AHSS (Automatic Frequency Hopping System). The audio will be reactivated whenever noise is detected. You get great audio clarity of the sounds you need to hear without any of that static and white noise. The monitor features a built-in audio shutoff module. When the sound is below a specific level for 10 seconds, the audio goes into sleep mode. It reactivates whenever noise is detected. So, while you are carrying the monitor, you can enjoy the absence of static and great audio clarity. The monitor will continue to do its job and you will not be inconvenienced or irritated by background noise. With VOX standby mode, you’ll save energy yet still be alert to baby’s every noise. Here’s how it works. After three minutes of quiet, the energy-efficient monitor turns off. This saves on both electricity and your battery. When the camera detects any sound the unit automatically goes from stand-by mode to on. If you want to, you can turn this feature off. Either way, the monitor is always in power saving mode until needed. Video streaming was never so good! The Infant Optics DXR-5 produces a picture whose clarity is way over expected standards of 2.4 GHz video baby monitors. This monitor has an advanced video chipset. With it, you get ultra-smooth streaming of full-color video at 30 frames per second. You’ll always be within contact with your child when you have a baby monitor by Infant Optics. It has a 150′ indoor range and 800′ outdoor reception. You can rest assured that you have a continuous connection with your child, no matter where you are in and around your house. Because this device is so lightweight and easy to transport, you can go your busy day and still have eyes and ears constantly on your little one. The Infant Optics DXR-5 2.4 GHz monitor is easy and safe for anyone to use. Each of the cameras in the monitor uses safe and secure FHSS technologies to send safe and secure audio and video data to the home base monitor. No one else has access to your audio or video feed. At 30 frames per second, this monitor provides video stream well above industry standards for 2.4 GHz video monitors. This means the data about your baby’s every move reaches you instantly! This durable, long-lasting monitor is battery powered. This ensures complete portability. It can be used without a power adapter. This is especially convenient when a nanny, a sitter, or a relative takes your baby somewhere where there is no power outlet available. As your needs change, the Infant Optics DXR-5 Video Baby Monitor expands with your growing family. Extra camera capacity is available. The DXR-5 monitor can grow with your changing family needs to support up to four camera units at once. To check on each child, you simply switch through video channels, via clicking a button on the monitor unit. It’s simple and easy to use this added feature. The monitor is equipped with automatic IR night vision. There is an A/C power adapter. The Infant Optics DXR-5 Baby Monitor is cost-efficient. It costs a lot less than many of its competitors. The monitor is easy to assemble and operate. An infrared night monitor makes it easy to see what is going on in a darkened room. Infant Optics DXR-5 has a long range so you can hear the baby from anywhere in and around the house. The device is small and lightweight for adults with an active lifestyle. Background noises and static are eliminated. Multiple cameras can be used with a single monitor. Picture and sound are clear. Microwave ovens, buildings with metal frames may disrupt the signal at close range. If sound levels fall below 60 decibels for more over three minutes, the video monitor automatically goes into standby mode. Camera units cannot be paired with multiple video monitors. While a few cautions exist, most never pose a problem for the user of the Infant Optics DXR-5 Video Baby Monitor. It’s a parent of top baby monitor model Infant Optics DXR-8 It is a safe, cost-effective, easy to operate a device that provides clear audio and video surveillance of children giving parents and caregivers reliable service and peace of mind.